The front also has a fingerprint reader hidden under the home button. There is also more RAM, too. 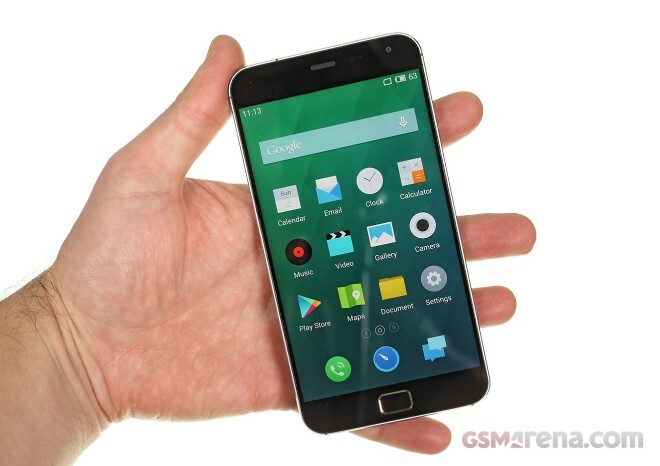 The MX4 Pro is turning out to be the phablet many Meizu fans have been wishing for. Headlining the insides is an almost identical Flyme OS which runs on top of the latest Android KitKat. Flyme OS has some neat new tricks up its sleeve, though, like the addition of Smart Touch. You can see that as well as the new fingerprint scanning button in our Meizu MX4 hands-on video. Check it out. Aside from the physical home button, the Meizu MX4 Pro looks like an oversized version of its non-Pro counterpart. The phablet has an all-glass flat front housing the big QHD screen and finger-reading home button. All of this is fit inside an aluminum frame that runs around the corners of the device. It’s not until you get past the edges where the metal ends and the plastic back cover begins. The Meizu MX4 Pro has it Power button located on the top, just like every other Meizu smartphone so far – it’s not the easiest to reach, especially on such a large device. Fortunately, Meizu has you covered – you can unlock the MX4 Pro with just as swipe on the locked screen. You can lock it back again just by holding down the home button. Thanks to this trick, you would hardly need to use the physical Power key on the MX4 Pro at all (just like the MX4). The fingerprint sensor embedded into the home button is very easy to use. Meizu doesn’t require you to swipe your finger across the sensor. Instead, it takes only a light tap for it to recognize your finger. The Meizu MX4 Pro feels good in the hand and it sits nicely, thanks to its rounded back. The slightly curved edges of the phone allow a comfortable but firm grip and for a 5.5″ device the MX4 Pro doesn’t feel cumbersome. It is also mere 11g heavier than its smaller counterpart. If the Meizu MX4 wasn’t pro enough for you, the MX4 Pro will offer the missing features for $120 more. Unsure if the added price translates into added value – hang tight until we give the MX4 Pro our proper evaluation.